Kikagaku Moyo (Japanese for ”geometric patterns”) are a Tokyo-based psychedelic rock band whose sound incorporates elements of Krautrock, Indian ragas, and acid folk. 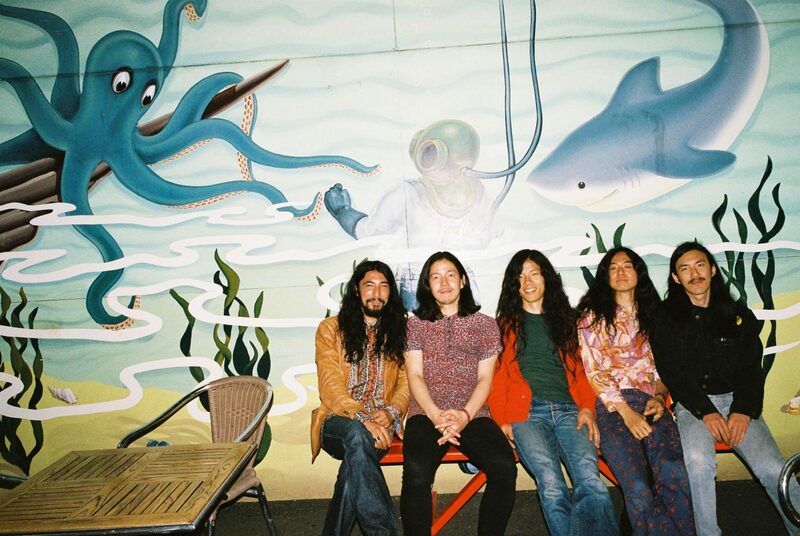 They balance heavy, crushing jams with softer, more contemplative moments, recalling Japanese psych groups like Acid Mothers Temple and Ghost, as well as their predecessors such as Far East Family Band and the Flower Travellin’ Band. The group was founded during the summer of 2012 by drummer/vocalist Go Kurosawa and guitarist/vocalist Tomo Katsurada. Joined by bassist Kotsuguy, guitarist Daoud Popal, sitarist Ryu Kurosawa, and guest vocalist/theremin player Angie Gotopo, the group recorded its self-titled debut in 2013. Initially self-released digitally, the album was given a vinyl release by Greek label Cosmic Eye later in the year, followed by an American release by Captcha Records in 2014. The group released two more albums in 2014 (Mammatus Clouds and Forest of Lost Children), and became darlings of the international psychedelic scene, with appearances at Austin Psych Fest and L.A. Psych Fest, in addition to successful tours of America, the U.K., and Europe.